Langkawi has the reputation as the go-to island for tourists in Malaysia. But on the other side of the peninsula is the ultimate tropical getaway. From luxury to backpacker, party to secluded, it has it all. And the best thing is that, although it’s not a complete secret, it’s not on the standard tourism trail… yet. 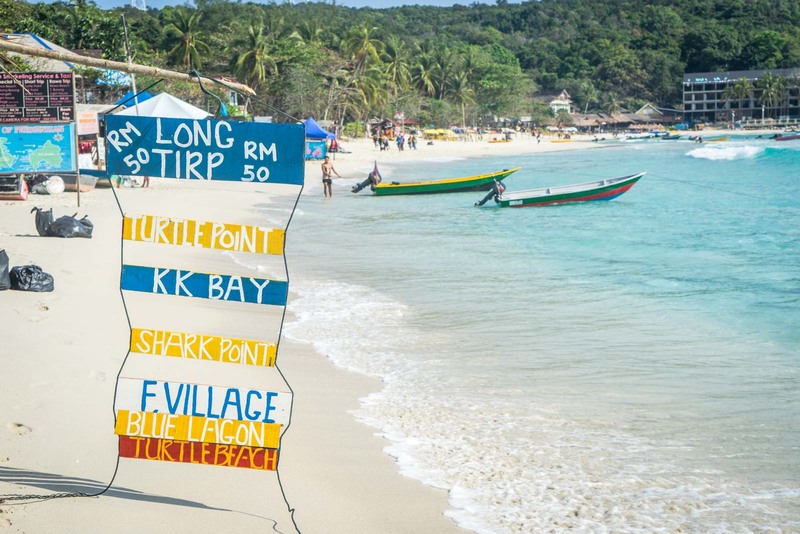 Welcome to the Perhentian Islands. Two mountains of green rise from the sea as I approach by boat. Almost all you can see is jungle. As I get closer, I can spot a few settlements around some of the coves, down by the coast. Behind them, just trees. 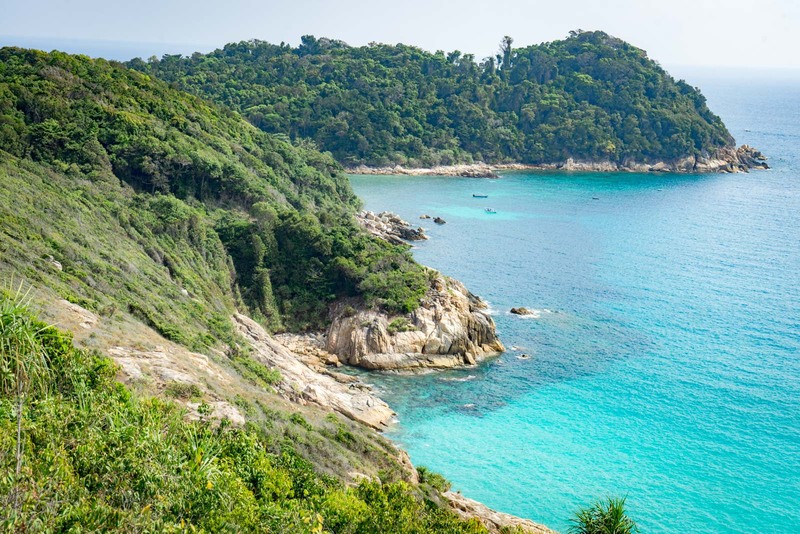 They’re called the Perhentian Islands, plural, because there are two of them. Perhentian Besar (literally: Big Perhentian) and Perhentian Kecil (literally: Small Perhentian). Which one you choose to stay at is normally decided naturally by the kind of traveller you are. 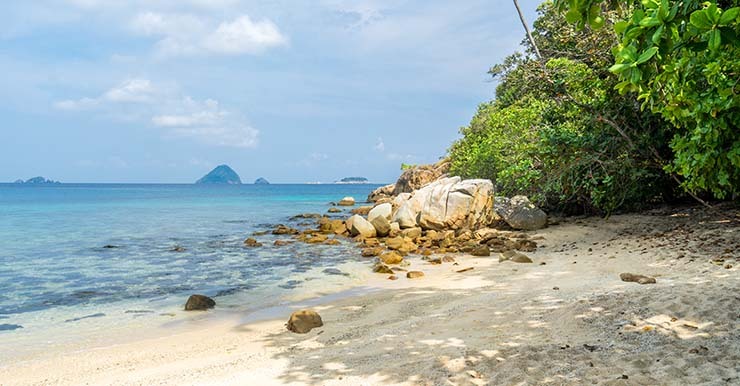 The larger island, Perhentian Besar, is the more expensive one. It’s known for luxury villas, honeymooners, wealthier visitors. There’s generally a slightly higher class of accommodation and services available. 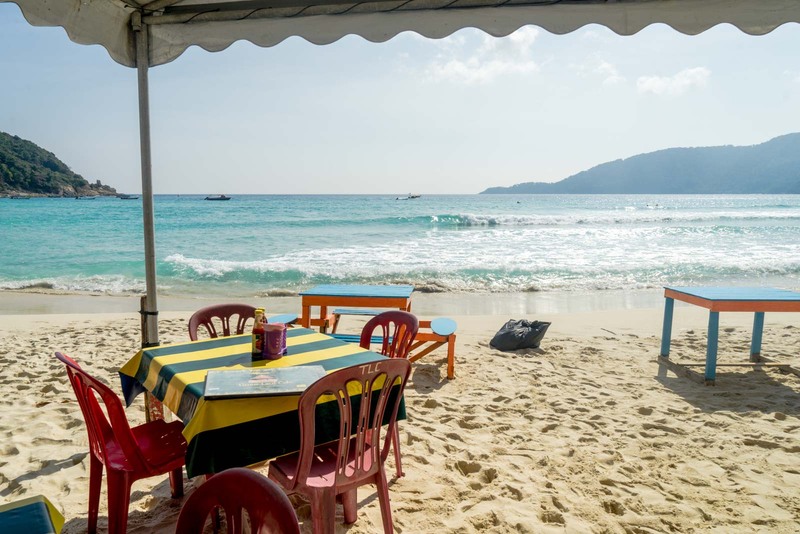 The smaller island, Perhentian Kecil, is a bit more budget – but that’s not to say visitors slum it. But the accommodation tends to be a bit more rustic and the tourism offerings more casual, catering for backpackers or local families. Of course, I’m heading for the small island. The boat pulls into the jetty at Long Beach and I jump off. There are a few stops around the island but this one was recommended to me because I haven’t booked accommodation and there are quite a few options here. Long Beach is also the spot most popular with younger foreigners. I walk along the beach and choose somewhere to stay. I get a bungalow with a deck, just back from the sand behind a restaurant. Time moves a little slower when there’s no rush to do anything. Without roads and cars, with limited phone reception and hardly any internet connectivity, you make the most of what is in front of you and don’t think too far ahead. There’s not much to do here – yet there are so many ways to fill the days. Most things involve the water somehow – being in it, travelling on it, getting to it. I notice that some people spend most of their day at the beach – swimming, sunbaking, sitting on the sand. The days get very hot and it wouldn’t be too comfortable to spend the entire time in the sun. But along the edge of Long Beach, where sand meets soil, are restaurants, bars, and other small shops that offer somewhere to rest in the shade with a cool drink. 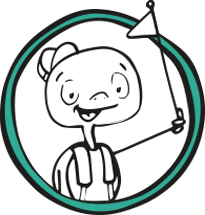 Probably the most popular activities are snorkelling and diving. There is no shortage of operators offering boat trips around the island, stopping at several different spots to snorkel, swim or go into the beach. It’s these other beaches, away from where I’m staying, that interest me the most. 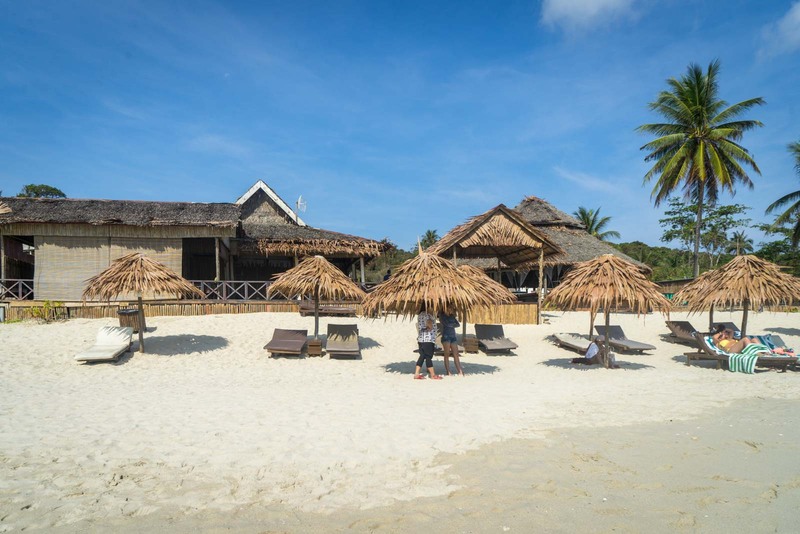 There are maybe half a dozen spots around the small island where you’ll find accommodation – either a single business or a collection of them. But there are just as many beaches where there’s nothing. I’m determined to find them… my way. I set out in the morning at about 9 o’clock, before many people have started their day. There’s not a huge party scene here at the moment – it’s mainly Malaysian tourists this early in the season and most of them don’t drink alcohol – so it’s not that people are sleeping in after a big night. It’s just so relaxed here that there’s no need to rush first thing. Most of the snorkelling trips start at about 11am. Rather than take a boat around the island, I’ve decided to cut through the middle. There’s a network of hiking paths that lead to different spots and I’m keen to visit a few of them. I make it to a place called Adam and Eve Beach. It could well be a garden of paradise… and I’m all alone. Nobody comes the whole time I’m here and I swim in the clear water, fish darting around my feet. I lie on the sand and soak up some rays. Out to sea, I watch the occasional boat go past. 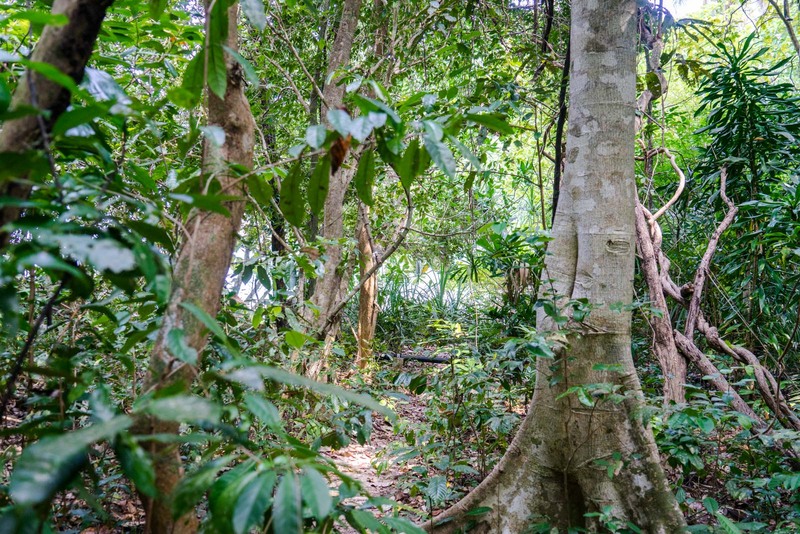 Behind me, the jungle forms a barrier of green. At the other beaches I stop at, there are other people. Just a handful, to be fair, but they ruin the world I have now created in my head where I own this island and have free reign of it. I had started to imagine that not only are the beaches all mine but also the fish in the sea, the coconuts in the palms, and the trails that take me between them all. Still, it’s east to feel isolated here, if that’s what you’re looking for. And not just from other people on the island – but from everything. 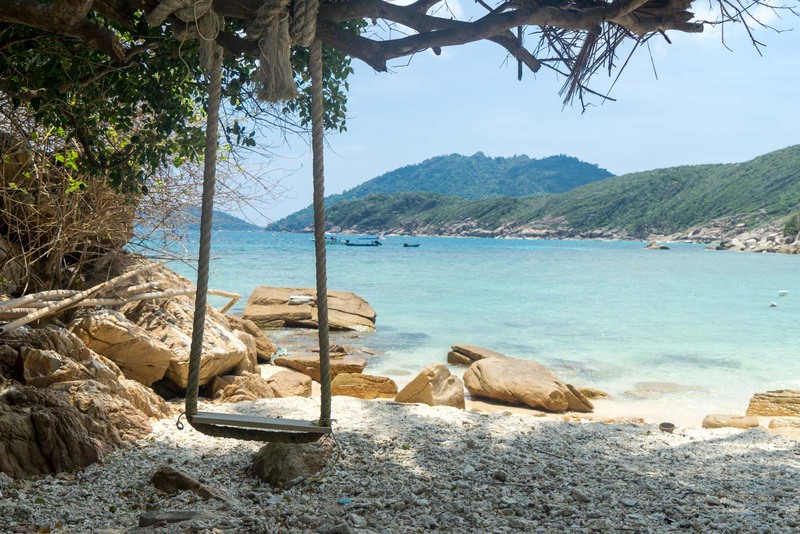 You do feel a bit cut off from the world here in the Perhentian Islands. They are really not that far from the mainland… but there’s something about the atmosphere here that makes you feel like you could be in the middle of the ocean. That’s what makes it so appealing… for now. 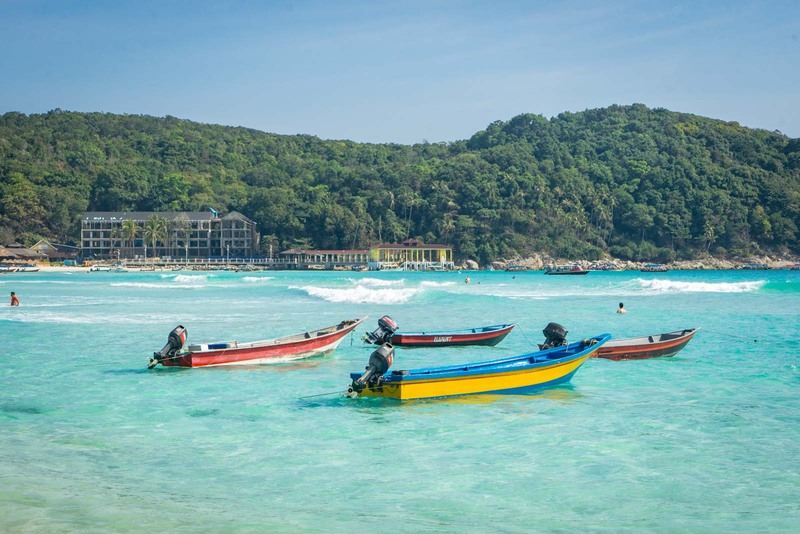 How do you get to the Perhentian Islands? To get to the Perhentian Islands, you’ll need to take a boat from the jetty at Kuala Besut (you can see the jetty on a map here). Often you don’t need to book the boat in advance but you might want to reserve a ticket during busy periods/weekends or for peace of mind. You can book the boat with Easybook or BusOnlineTicket. The boat is 70RM return. There are a few ways to get to Kuala Besut. The nearest airport and large city is Kota Bharu. A taxi from there will take about an hour (there are normally minibuses at the airport offering cheap seats that will leave when they’re full). You can get a bus from the centre of Kota Bharu. You’ll take the Number 639, which costs 6RM and takes abut 90 minutes. There are also direct coaches to Kuala Besut from places like Kuala Lumpur, Penang, and Johor Bahru. To check timetables and prices, and book a seat (recommended), I suggest using Easybook or BusOnlineTicket. 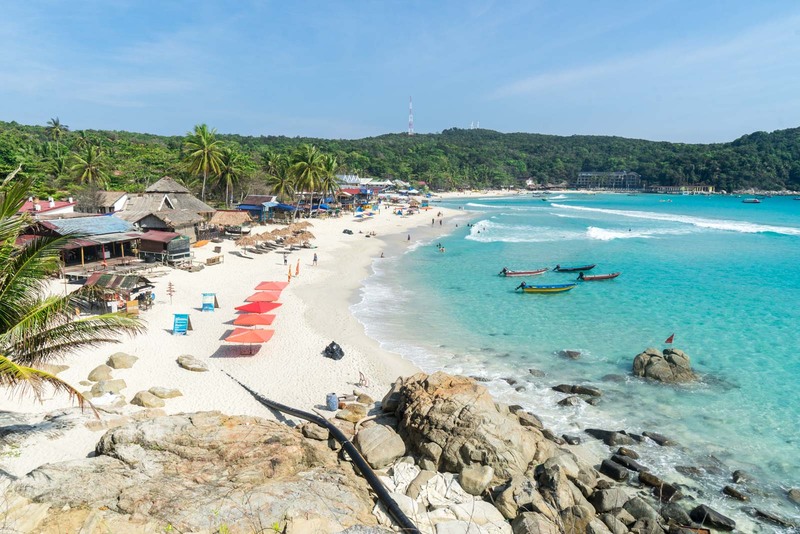 Where should you stay on the Perhentian Islands? 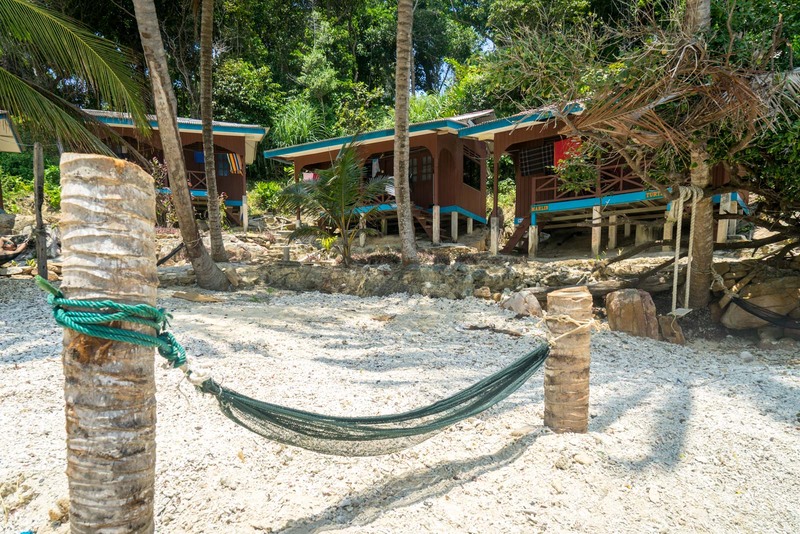 Accommodation on the Perhentian Islands can seem a little tricky at first. Many of the places don’t list themselves on the online booking sites. If you’re not travelling in peak season, you can generally just turn up and find something – but it’s a risk when things are busy. 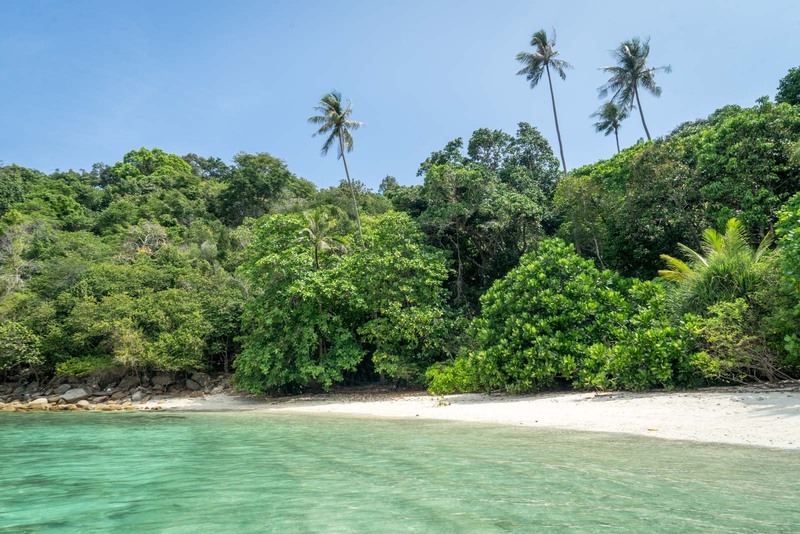 If you want to arrive without a reservation and take your chances, I would suggest heading to Long Beach on Perhentian Kecil (Small Perhentian) because it has the most options and range. If you would prefer to have a look at the choice of what you can book online, I would recommend comparing Agoda and Booking.com. They seem to have the best options (but are probably a bit more expensive than you would find in person). Otherwise you need to contact accommodation providers directly through their Facebook or websites. WANT TO KNOW MORE ABOUT MALAYSIA? 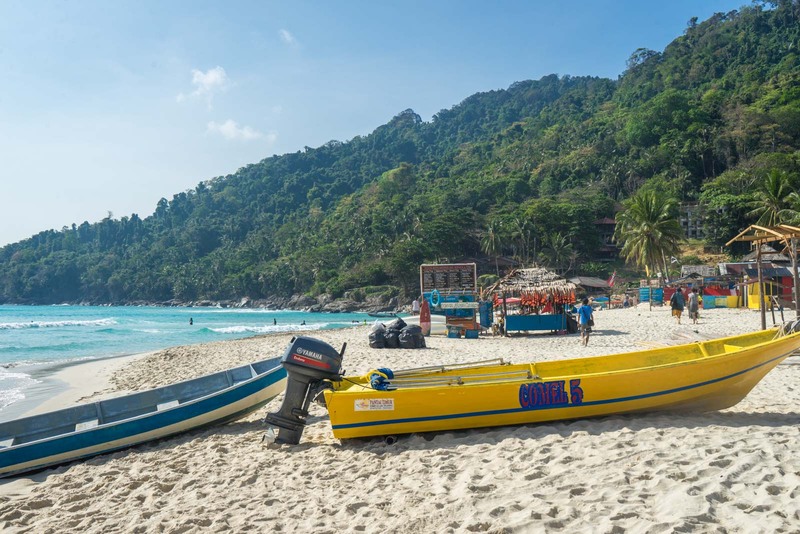 Why the Perhentian Islands are the ultimate getaway! You may also want to consider taking a Malaysia tour, rather than organising everything on your own. It’s also a nice way to have company if you are travelling solo. I am a ‘Wanderer’ with G Adventures and they have great tours in Malaysian Borneo. I am simply awestruck by the beauty of Perhentian Island. the pictures are stunningly clicked. Loved it throughout! Incredible pictures and a great guide, Malaysia is definitely on the travel list! Very well written, Pictures are beautiful. I have plane to visit Malaysia next month. After reading your post i am too exited to go. Thanks for great share. Great pics. 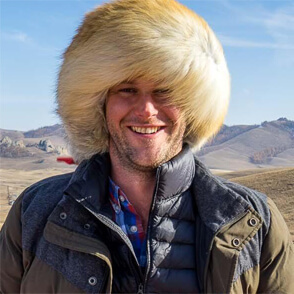 Put it into my travel bucket list. great article. Thanks for all the guidance and sharing the pictures. i loved reading this article and i almost felt as if i was with you there. well written. very nice article. Can I go there in January?